In considering the strategies of Tamil parties with regard to the forthcoming election, one needs to look back too at what transpired during the Presidential election. The results of that have been used to argue that the strategy employed by the TNA worked brilliantly. They have been able to claim that the North and East voted against President Rajapakse, as did Nuwara Eliya, which suggests that Sri Lanka is polarized along ethnic lines. Thus they can once more declare that they have received a mandate for Tamil Eelam, and continue to conduct politics in line with the commands of the shadowy forces abroad who financed Mr Prabhakaran and encouraged his intransigence. What this will mean in reality though is continuing attrition, with the Tamil people not being permitted to play their full part in the Sri Lankan body politic. The TNA contention, or rather the contention of its current extremist leadership, as exemplified by the pronouncements of its cheerleaders abroad, would be that this will help in the achievement of their ultimate goal, a separate state. The local claim that full autonomy, on the lines of the ISGA they nearly obtained in 2003, will suffice, and that nothing further will be agitated for, is of course at odds with all practical experience as to the way such autonomous entities fall prey to adventurism, internal as well as external, as we saw so graphically with Kosovo. For all I know, Mr Sambandan’s strategy may prove to be justified. But it is unlikely that his dream will be realized in the short term. Meanwhile he will have to hope for continuing suffering, to fast forward this goal, for the people whose interests he claims to represent, of whom he used to claim earlier that the LTTE were the sole representatives. Fortunately he is unlikely to get that. The government has shown that it will do whatever it can to develop the North, as well as the East, and the President made it clear in his speech just after the election that he would make no distinction between those who voted for him and those who did not. This is to state the obvious, but it needed to be done because there are many who would claim the opposite, that political success is about partisanship. Indeed that view may also be held by a few people in government, which is why it was important that the President made his position clear. But at the same time it would also be useful for all those in government to study the results carefully, and work out how these could be improved on for the future. One very simple factor to be kept in mind is that the percentages obtained by either side in such a small poll would not necessarily have been replicated in a larger one. At its simplest, those who voted were the more motivated, those with the capacity to make their way to the polls under difficult conditions. Obviously, then, the social divide that obtained in the rest of the country would have operated in the North too. Those who had suffered in the past, and are finding things better now, are less likely to have voted than those who are opposed to the government on ideological grounds. That having been said, clearly the government failed to get its message across to the vast majority of the population of these areas. One reason for this was a paucity of communication skills, a phenomenon that also obtains in the rest of the country. It was obvious, for instance, that the massive development schemes government has worked on actively over the last four years, were not well enough known, even in the South, until just the last few weeks. In the North obviously less had been done, in the eight months since it was liberated, and less had been done to communicate the successes. This however is something that can be remedied swiftly, through even harder work and more obvious efforts at partnership, which had not been possible in the immediate aftermath of conflict. Certainly current government plans for enhanced recruitment in fields where there has obviously been deprivation before, in particular in the armed forces and the police, should not only be expedited, they should also be better publicized. And it will be desirable to move much more swiftly on ensuring languages in common, and working on educational reforms that will facilitate youngsters growing up together in at least a few schools in each Province. Meanwhile there is also another reason for the paucity of support this time that I believe government must seriously address. Perhaps because of the relentless insistence on all sides that the TNA were the principal representatives of the Tamil people, government sought long and hard to reach understanding with their parliamentary leaders. This was counter-productive because it inhibited working at full speed with the Tamil political parties that had stayed independent for so long of the Tigers. Sadly these parties also had differences amongst themselves, which prevented the emergence of a strong political grouping allied to government. But, whereas government energies should have been devoted to bringing these democratic forces together, instead they were spent on trying to persuade the TNA to forget its past, an exercise that proved futile. The local elections, in which forces allied to government did much better than in the Presidential election, should have been an eye opener. One lesson to be learnt from them was that the forces that had stood out against the LTTE in difficult times had to be brought together if they were to outnumber the former fellow travelers. Another was that they also had to have space to operate on their own, albeit within the framework of adherence to basic government policy. This will of course prove easier after electoral reform that does away with the need for consolidation that our strange system of proportional representation entails. But in any case the hallmark of the national coalition the government needs, so as to fast forward its development policies effectively, should be pluralism and diversity, not monolithic conformity. And government must also stress the need to work together, with dignity and opportunities for initiative, for quick results. 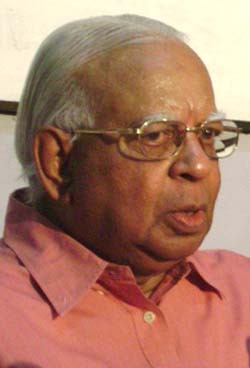 After all Mr Sambandan campaigned, not on the basis of polarization, but of support for a character he argued would be a positive President for the Tamil people. I do not think he was so much in cloud cuckoo land, and his past suggests that he was simply being a spoiler, as always, and that he will do his best to claim that the country is irreconcilably divided. But insofar as he cannot admit to his swansong having been based on such a motive, it should be made clear to the open-minded majority of the Tamil people that he failed in what he claimed he was doing. Contrary to his plans, the country still has a President who has never professed a majoritarian outlook. It should therefore be made clear to the people of the North that working together with the current leadership of the country is the surest way forward. Proving this promptly through concrete benefits will ensure that the destructive dreams of the dinosaurs of the TNA never find fruition.